Cute little pink flowers adorn this easy to care for low growing flowering shrub. 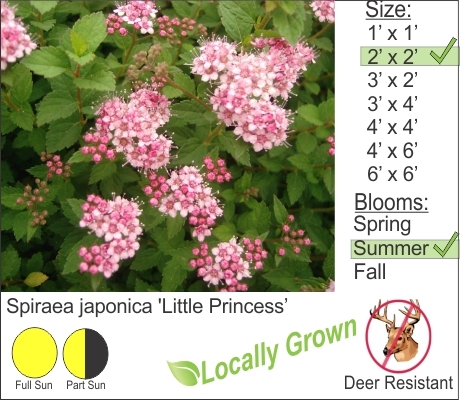 Little Princess Spirea flowers in the summer and is deer resistant. Trim after flowering is finished. If you trim in the spring you will be cutting off the flower buds for the season. Check out our pruning guide here. this shrub works well with other shrubs like Wine & Roses Weigelia.